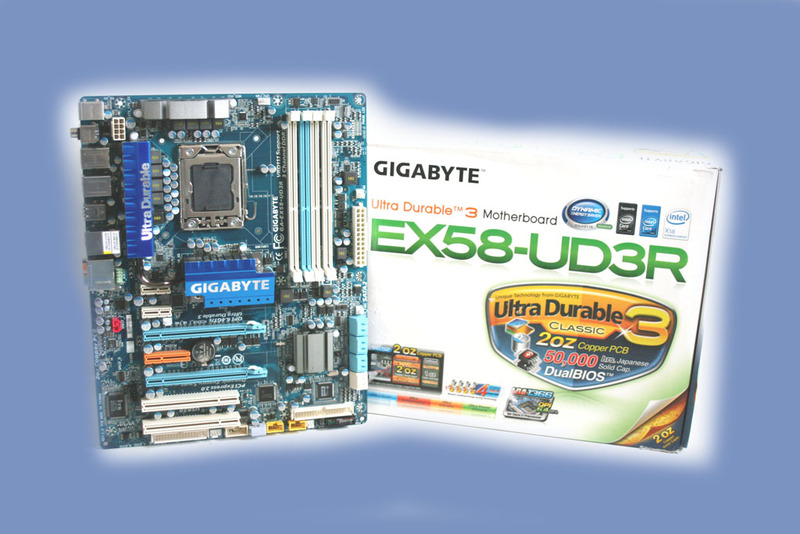 Gigabyte were one of the first motherboard manufacturers to take advantage of Intel's latest X58 chipset with the formidable (and current editors choice) EX58-UD5. Along with the range topping Extreme (which is a clone of the UD5 but with fancy cooling) and the mid-range EX58-UD4P we reviewed here, Gigabyte also have a budget board in the form of the EX58-UD3R which we have for review today. The UD3R is aimed toward the entry level of the market and despite costing a pint of lager over £150, the UD3R is certainly one of the cheapest X58 motherboards out there today. As with the UD4P, the UD3R is a stripped down version of the flagship motherboards, each having less features as we slip down the scale. That isn't to say the UD3R isn't a capable motherboard, far from it. Being Crossfire compatible as well as having RAID capabilities, 8 SATA ports, twin 16x PCIe 2.0 slots, 8 USB ports (expandable to twelve), things are not quite as clear cut as you may think. Budget board maybe but it's certainly not lacking in features. Sporting a similar Dynamic Energy Saver to it's high end brother, the UD3R has hardware based dynamic four-gear switching as opposed to the UD5's 6 Gear switching. The UD3R also features the confidence building 'Dual-BIOS' technology which automatically recovers BIOS data when the main BIOS has crashed or failed a flash due to improper BIOS updating. For those who do not like to delve into a motherboards BIOS, Gigabyte also include EasyTune6 which allows the monitoring and tweaking of system components in a windows environment. The EX58-UD3R is the latest X58 Series motherboards of GIGABYTE, designed from the ground up to unleash the awesome power of Intel’s new Core i7 processors. Equipped with a host of new features including the new QPI interface, 3 channel DDR3 support, CrossFireX™ support, Ultra Durable 3 (Classic) technology and the industry’s most extensive range of overclocking features, the EX58-UD3R is bringing excitement back into the high performance motherboard industry. As you can see, Gigabyte have only very slightly trimmed some of the excess fat from the UD3R's bigger brother, the UD4P. The most significant difference is the omission of two DDR3 ram slots. Having just 3+1 ports might affect those wishing to utilise huge amounts of DDR3 but for the average user 6+GB is ample.